Are you able to keep things to yourself? If you cannot, it is probably best.. for your own safety, that you stop reading this right now. If you can, then we have to let you into a secret. 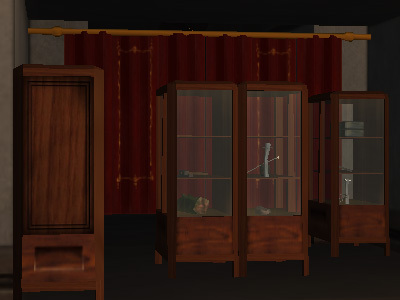 Hidden in Borealis is an underground bar, it is in the bottom of a shop selling antiques. Don't believe us? Then you had best go and look for yourself. 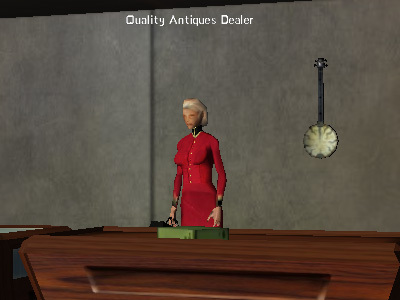 From the inside, you are welcomed by a Quality Antiques Dealer who is selling lots of wonderful antiques for you to peruse at your leisure. For the observant ones amongst us, the bright red curtain acting as a backdrop to the left of the shop is too much of a distraction to let go un-investigated!! Making your way past the red curtain, you will enter an underground bar area. 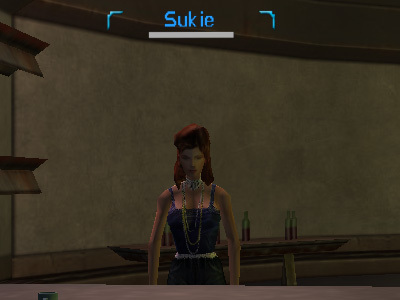 Sukie is stood waiting for you behind the bar, ready to serve you a drink of your choice. Just be careful about how loud you ask her any other questions. After a quick chat, she will direct you to a man at the back of the bar. The only other person in the bar is John Smith, but in the locked back room, there are a few high-roller's taking making odds and taking bets on the outcome of the Battlestation. 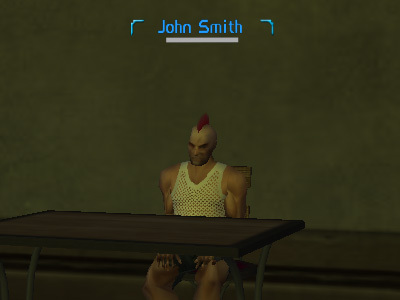 Sitting on a chair alone in the bar, John Smith is apparently involved in taking bets for the Battlestation as well as manipulating the Omni-Clan struggle on Rubi-Ka. Talk to him and he will offer you one of four missions. He will upload a mission to your mission panel that tells you that an illegal organization, UBSL, is interested in tipping the scale in the battle station. They take bets and are always looking for a way to control a game. So, dependant on your level you need to go and do a round in the Battlestation. You can read up on that here. As soon as either side has 400 points (sometimes between 400 to 440), your mission will update. You can head back to John Smith after this point when you leave the Battlestation to receive your XP/SK reward and Victory Points. If you join the battle station AFTER a side has got the threshhold amount of points and the otherside does not reach this quantity while you are on the battlestation, your mission will not update. It is important to be on the Battlestation when this threshhold is reached. Your second option will be to enter an area where some unlicensed illegal notum miners are operating. You will be tasked to kill 3 of these illegal notum miners. The location where the notum miners are operating has no (0%) suppression gas, so be careful. You will be competing with everyone else for a piece of the illegal notum action on Rubi-Ka. You can find a guide for this mission HERE. Your third option will be to locate and target five different types of land-control tower. Locating the towers will be difficult enough, but depending on the suppression gas being emitted by these land-control towers, you might find yourself setting off an all out notum war with another organization. Hints: You will be tasked to locate a Massive Cannon Turret, a SAM Battery, a Guardian Conductor of Ransacking, a Fire Spouting Tower, and a Control Tower of the opposing faction. The first four towers can be of either faction, but the last tower will be that of the opposing faction from you or a randomly selected faction if you are Neutral. 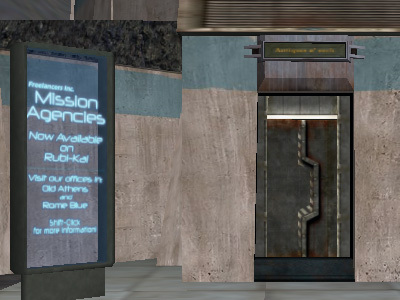 From time to time, one faction may have complete dominance over the opposing faction, so make sure the opposing faction actually has at least one control tower planted somewhere before you start this mission. Your last option will be something special depending on your level. If you're curious about these missions, then you'll just have to talk to Johnny yourself. This option will result in John telling you that he has nothing for you if you are below level 50 (unconfirmed on the lowest level this option can be chosen). NOTE: There is an 18hour lock out timer on doing this mission with the exception of the Battlestations mission. You can, however, accept the Battlestations mission up three times (or twice, if you select one of the other missions first) within an 18 hour period. Updated information for mission update. Thank you Cbus97, Cybertron, Johael & Berim.